The city of Maastricht –birth place of the euro– has a bit of a reputation of “not being the best cycling city” in the Netherlands. But with a modal share of cycling of almost 30% of all trips up to 7.5km it is really not doing bad at all. At least not compared to cities in any other country. The historic city (founded by the Romans) in the extreme south of the Netherlands is surrounded by some hills. But since it was formed on the banks of the river Maas (Meuse) the city center is still relatively flat. Inset: Wikipedia example of a cycle path. The big picture shows it is not used anymore, a bad example of an equally bad situation, and not a good representation of Maastricht cycling infrastructure. A strange picture of a Maastricht cycle path can be found on the Dutch Wikipedia page ‘Fietspad’ (cycle path), see inset in the larger picture above. A large yellow chunck of concrete is blocking almost the entire width of the cycle path. Weeds are growing in abundance and the surface seems a bit neglected. When you look at the picture you could come to the conclusion that the Maastricht cycling infrastructure does not have the quality we are used to in the Netherlands. But if you were to actually visit the site of the picture it becomes clear that this particular stretch of cycle path has been out of use for a long time. In yellow painted lines it is clear that a diversion was created. Granted, it is a strange situation that has apparently been like this for some years now (the yellow paint has already faded) but it is clear that this selectively cropped picture is not representing Maastricht cycling infrastructure in a good way. 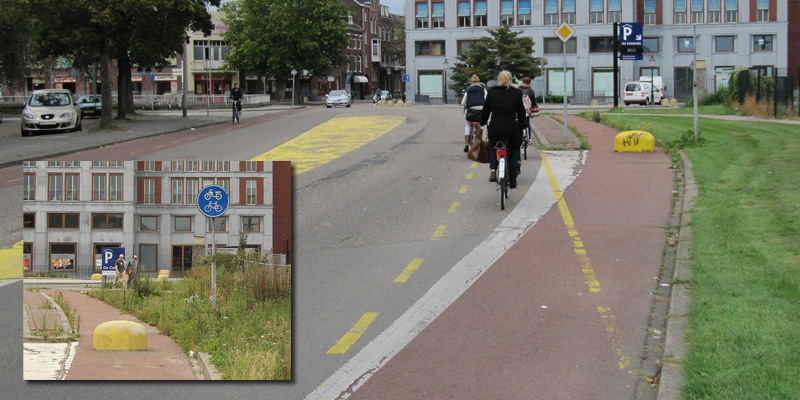 Such a delibrate misrepresentation of Dutch cycling infrastructure is something which is seen more often. Some weeks ago I had a meeting in the Maastricht University Hospital. Some of the people attending arrived by car, another person and myself arrived by OV-Fiets rental bike from the central railway station. After the meeting we decided to all go to the city center to have a drink and something to eat. I decided to film the ride. Judge for yourself how ‘bad’ the state of the cycling infrastructure of Maastricht really is. Ride from the Maastricht University Hospital to the center of the city. We arrived in a restaurant in the city center only 10 minutes after we had left the hospital. We ordered a drink and waited for the others. They had to walk a considerable distance to the parking garage. Pay and then find their way through rush hour traffic. For us the ride was 2.5 kilometers. As usual in the Netherlands, the route for the cyclist is more direct. In fact the distance was twice as much for a car. The main arterial streets in Maastricht are quite congested and they had to wait at a number of traffic lights. Once they finally arrived in the city center they had to go to a parking garage there and walk to the café. We had all anticipated they would arrive well after us cyclists. But nobody would have guessed that they were to arrive 35 minutes later! We had just finished our second drinks… No wonder that many of the Dutch are so keen to cycle everywhere. How I wish it was "that bad" in here. Quite a lot of speeding on that road alongside the Maas. Is that normal? @Richard, speeding? where did you see that? I didn't, at least not alongside the Maas. I only see cars driving under the maximum speed of 50km/h (ca. 31mph). I did see higher speeds on the bridge over the Maas, but there it is allowed (70km/h or 43mph). Just goes to show that it's the engineering that enforces (or in this case fails to enforce) the speed limit, not the fear of "strict liability". If it doesn't look like a 30kmph road, people won't drive under 30kmph on it. Other than the dual carriageway along the river, Maastrict was nice. The bicycle infrastructure was noticeably behind that of the rest of the country, with a few crap cycle lanes on the sort of roads where you'd expect good tracks, and there were noticeably fewer cyclists than in the north east and Utrecht. But I'd happily take Maastricht's infrastructure and modal share over anything in the UK. I rode the bit between the concrete hippo and the end of the video on the way back from Aachen a couple of months ago. The only place I found in NL with cycling conditions that were really bad, almost British, was Valkenburg, a few miles east of Maastricht. @Joe the 30kph sign there was for building reasons, not permanent. While I showed you the bridge it was already ended and nobody slows down for just 10 meters. It doesn't look like a 30kph street because it normally isn't. I know about the steps (and elevators) of the cycle/pedestrian bridge on the other end, but I will still take it next time, a far more pleasant route! Wenn they'll finally update all this “crap”, is there any way the counsel would be willing to give away their old and outdated cyclepathes for free? We would make some good use of them in Germany. We could suddenly transform one random city into cycle paradise.